This lovely, light filled, and plant-filled one-bedroom flat, is set within a 1930’s factory building (originally built as a print-works), which was originally converted into thirteen flats ten years ago. It’s in Hackney, very near to London Fields, which to anyone who isn’t in the know, is now a very desirable and green part of East London. The designers are Louis Hagen Hall and Catherine Verna Bentley of Bentley Hagen Hall and it’s their first personal project. 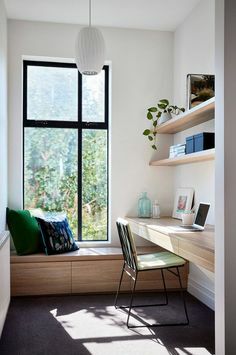 Amazingly, they have managed to squeeze a hallway, bedroom, bathroom and living/kitchen/study area into 46 square metres but the space is also packed with personality. Mid-century furniture jostles with books, art, collections and plants. Lots of plants. And being the nosy-parker that I am, I wanted to know how they tackled the project and what they were most happy with. 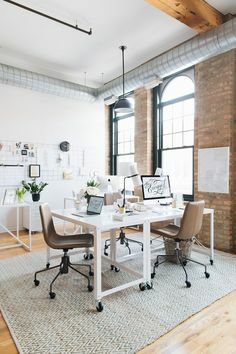 What were your main objectives when designing the space? Being such a small space we wanted to maximise storage, something you wouldn’t usually find in a London apartment of this size! We also wanted a flexible study/spare bedroom area to run the business from, which could be closed off from the main living space. Essentially this tiny flat had to store plenty of clothes, allow for an office with reference and sample libraries, provide a generous kitchen for entertaining guests, and have somewhere for them to stay if visiting from out of town. We also wanted to incorporate a lot of natural materials – we chose Elm for the cabinetry for it’s warmth and character, and decided to leave as much of the fresh plaster raw as possible to soften the otherwise bright, industrial space. 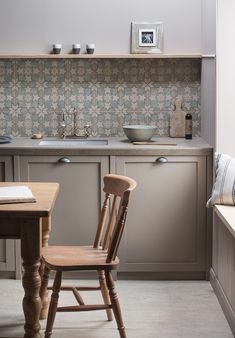 Our good friend and joiner Tim Gaudin made the kitchen worktop (his first experiment with pouring concrete) as well as the cabinets, and we were all over the moon with the result. 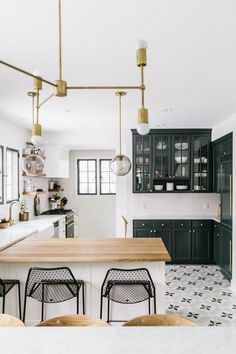 The colour and texture compliments the elm kitchen cabinets perfectly. On top of that we wanted a luxurious (if compact) bathroom. At first the plan was to work with the existing internal structure and layout, but we soon realised that this would not allow for the kind of storage we wanted to incorporate into the flat, nor would we be able to improve the layout of the bathroom. Because the building was originally an open plan factory, we didn’t have to worry about any internal structural issues and were able to take all the walls out and re-instate them where we wanted. We then designed, and had custom made every item of joinery, including the kitchen, and three storage walls (hiding everything from the washing machine, to the larder, to all our clothes and shoes – very necessary in a small space!). Because we ended up re-doing all the partitions, we were also able to re-wire and re-plumb everything to our specification. This made a huge difference to the overall design as we could improve the positioning of the radiators and lighting, which can be a real hindrance when you’re trying to work around them in a re-design. The last major improvement was to the bathroom, which was completely re-planned and re-fitted. We were particularly pleased with how the bathroom turned out – we took a gamble on a material we had never worked with before (the dark grey Tadelakt for the wall finish) but it worked out well, especially in combination with the brass detailing and solid Monterey Cyprus basin deck. The bathroom probably best represents the concept of our mixed aesthetics – the crisp wooden deck, cement floor and glass screen, contrasted with the rough plaster and traditional brassware. We are very different types of designers with different tastes – and both take inspiration from all kinds of places. 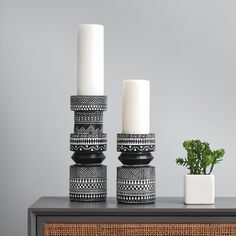 More specifically, though, Louis tends to be influenced by mid-century modern and contemporary minimal architects and designers, while my (Catherine) aesthetic is more bohemian, eclectic and “wabi-sabi”, which is influenced by my former travelling years in the music industry. We meet somewhere in the middle, which can make the process a bit challenging (! ), but makes for very pleasing results. Despite being the ones who designed it (and without being biased! ), it has surpassed our expectations in many ways. Creating one large multifunctional room can often be a challenge to resolve from a designers point of view, but they way that all the storage and services are tucked away means we have been able to enjoy the space to its full potential. We’re particularly surprised at how the design of the bathroom has resulted in such a relaxing space. Generally the flat feels a lot larger than it did before, despite the fact that we have effectively reduced it’s footprint/volume. Beautiful! May I ask where you got your drop leaf table from as I am looking for one just like that? Thanks. It is beautiful Lucy but I’m afraid it’s not mine. Good luck with the search. I love plants. 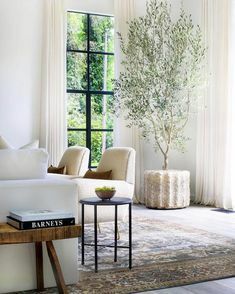 No home is complete without some natural greenery. Lovely home!